Another Hockey Stick? | Watts Up With That? Green forces, eager to promote their theories of global warming, appear to be practicing intellectual recycling. Is this the return of the notorious hockeystick – which, in 2001, was the central dogma of Anthropogenic Global Warming (AGW) believers? This quasi-religious faith in catastrophic AGW still remains a prerequisite for membership in scientific and media elite circles, even in the face of the failure of earlier (model) predictions of apocalypse to manifest, and the admission by an apostle of the faith that for the past 17 years global temperatures have not increased — contrary to the projections of every climate model. As with other religious fanatics, the failure only drives adherents to recycle past claims. Last week, in The Anatomy of Climate Science Hype, I discussed the manner of collaboration of the unholy trinity: ambitious scientists, a science journal anxious for publicity, and the old grey New York Times eagerly publishing anything that may tend to confirm their credo. In yet another NYT story (March 7) by science reporter Justin Gillis a research paper (March 8) in the formerly respected journal Science was previewed. After a great deal of work in analyzing proxy (historic, non-thermometer) data of the past 11,300 years, the start of the current warm interglacial (Holocene) period, the authors conclude that “recent warming is unprecedented.” It is not — but never mind. The same claim had been made previously (in a 1998 paper in Nature) by the notorious “Hockeystick” graph produced by Michael “hide-the-decline” Mann, and exposed as being “not only wrong but essentially worthless” – to adapt a famous quote of one of my teachers, Nobel physicist Wolfgang Pauli. The IPCC latched on to the Hockey-stick graph in 2001 as its main crutch in support of its claims for AGW. It promoted a newly minted Ph D student to international fame – or perhaps, notoriety. One can learn all about his fall from the pinnacle from Andrew Montfort’s book The Hockey Stick Illusion: Climategate and the Corruption of Science. The chapters on Climategate, based on thousands of e-mails, leaked (hacked? stolen? — it depends whom you talk to) in Nov. 2009, relate the whole sordid story of a gang of IPCC scientists, mainly British and US, conspiring to control what goes into IPCC reports and scientific publications. The four authors, three from OSU and one from Harvard, are quite fuzzy in defining the word “recent.” Their analysis takes 1950 as “present.” But then they add a humongous temperature increase by using all of the 20th century. That’s really the crux of their claim, but also their weakest point: The only warming that’s sure is from 1910 to 1940. Although that warming is certainly genuine, only a few fanatic scientists believe that it is human-caused. Not even the IPCC considers the warming up to 1940 as anthropogenic. On the other hand, the large surface warming claimed from 1979 to 2000 may not even exist. Opinions are divided on this important question. The warming is certainly not seen in the satellite data, the best global temperature observations we have. Of course, the authors ignore the fact that there has been no warming for at least a decade – while anthropogenic greenhouse gases have been increasing more rapidly. According to Philip Jones, the IPCC’s guru on Global Temperatures, there hasn’t been any significant global warming for 17 years! Even stranger is their forecast for the future — entirely based on climate models that have never been validated. Their exact quote is: “By 2100, global average temperatures will probably be 5 to 12 sigma deviations above the Holocene temperature mean.” In non-technical language, this means a huge increase; but the probability of a large temperature rise is practically nil. Of course, they leave themselves plenty of room by providing at least half a dozen projections depending on assumed scenarios. What is distinctive about this latest effort at claiming unusual 20th-century warming and implying a human contribution is their presentation. The original hockey stick, first published in 1998, explained carefully that the modern instrumental (thermometer) record had been grafted onto a centuries-long proxy (non-thermometer) record; the OSU paper neglects to inform the reader about this important fact. As a reviewer of IPCC reports, I well remember efforts to hide the mixing of proxy and thermometer data: IPCC’s 3rd Assessment report (2001) showed the proxy temperature record with a black line and the 20th century temperatures with a blue line. I complained that these were very hard to distinguish — especially in a black-and-white Xerox copy. Since then, the IPCC and everyone else have used a distinctive red color for the instrumental data. That kind of distinction, however, is missing in the present OSU-Harvard paper. To use a current analogy: it’s like putting horsemeat into Swedish meatballs that advertise beef. In the case of the meatballs, the DNA evidence betrayed the addition of horsemeat. Here it is the fact that one sees sharp temperature changes at the end of the record — despite the authors’ statement that they have used a 100-year smoothing of the raw data. With such long smoothing times like a century, one cannot expect to see temperature spikes that may only be a decade long. So what did they really do? I suspect that the paper is a rehash of Marcott’s doctoral thesis. He too is a newly minted PhD (in 2011), lucky enough to get Hockey-stick #2 not only published, but internationally promoted. It’s all based on analyses of 73 samples of deep-ocean sediments, corals, shells, etc. Nothing really new here: In 1996 Lloyd Keigwin (of the Woods Hole Oceanographic Institution) published such an analysis in Science. He found that it was warmer 1000 years ago (during the Medieval Warm Period) – and much warmer 3000 years ago and earlier. This whole episode is one more illustration of once distinguished scientific journals hyping an upcoming article by sending out early press releases to selected journalists who will write a sensationalized story. It may impress laymen but it will have no significant impact on the real science debate about AGW. Its impact on policy is nil – or should be. S. Fred Singer is professor emeritus at the University of Virginia and director of the Science & Environmental Policy Project. His specialty is atmospheric and space physics. An expert in remote sensing and satellites, he served as the founding director of the US Weather Satellite Service and, more recently, as vice chair of the US National Advisory Committee on Oceans & Atmosphere. He is a Senior Fellow of the Heartland Institute and the Independent Institute. He co-authored the NY Times best-seller “Unstoppable Global Warming: Every 1500 years.” In 2007, he founded and has since chaired the NIPCC (Nongovernmental International Panel on Climate Change), which has released several scientific reports [See www.NIPCCreport.org]. For recent writings see http://www.americanthinker.com/s_fred_singer/ and also Google Scholar. There is a special place in hell for the “Chicken Littles” of the cAGW claque who are responsible for the enormous waste of our precious resources of time and money. Very well said. Why has NSF contributed to the hype for this article? Why has an NSF program director contributed to the hype by going on record as supporting the claim that temperatures today are higher than they have been at any other time in the Holocene? OMG, it’s worse than we thought. Looking at the acceleration of the temperature rise I predict that next year will be 1,421,765.436732478 C in London on July 5 at Midday. We are all doomed! The only way to stop this is to rewrite the model code to include the super-duper-enhanced water vapour feedback parameter. Fingers crossed. A great pleasure to read. “Hiding the Data Mix,” indeed. Shakun is now a post-doc at Harvard, but he comes “from” this Oregon State group which includes Shaun Marcott and their PhD advisor Peter Clark. Their work and methods seem closely entwined, so it may not be the case that these articles have gotten any/much independent scrutiny before now, given the cursory nature of friendly review (for the appropriate messaging of course) at journals in too much of climate science. Something for stats and proxy auditors to look at in comparison to the new Marcott et al. (2013). Marcott and Shakun, as recent PhDs at Oregon State, worked closely together under the direction of Peter Clark. Maybe these three are transforming climate science, or maybe they are all too close to shoddy and lax uses of proxy data for convenient messages? Willis had two posts last year highly critical of a Shakun et al (2012) paper in “Nature” which included Peter Clark and Shaun Marcott as co-authors. Get over to climate audit. MacIntyre has just blown the lid off of the Marcott paper. Marcott told McIntyre that his research is not robust for the twentieth century. Marcott forgot to tell Major and Major forgot to ask. Would someone in congress please investigate NSF’s promotional activities to ensure that they do not make radical, scare mongering claims that go beyond the science? The Marcott paper must have been written and published as an example of howNOT to conduct proper stats, resolution etc. I mean……really…..what other possible reason could there be for this junk? The cause of this illness is demonstrated nicely by Climategate 3. The cure is honest science. Let’s only Dr. Marcott can catch the cure quickly before he further embarrasses himself. HankH and Suyts have been hard at also. He He….you’ll love the second link. The same claim had been made previously (in a 1998 paper in Nature) by the notorious “Hockeystick” graph produced by Michael “hide-the-decline” Mann, and exposed as being “not only wrong but essentially worthless” – to adapt a famous quote of one of my teachers, Nobel physicist Wolfgang Pauli. Mann’s hockey sticks “not only wrong but essentially worthless” . . . . . priceless. We all owe a debt of gratitude to Fred Singer for all he has done on this issue over the past three decades. He knew the science was sketchy from the beginning and he courageously opposed the incoming tide of politicized science and propaganda at no small cost to himself. Now we have two hockey sticks – one for each goalie. Which side will win? Oh, I forgot – they’re both on the same side – oh well, the way our side has recently been going, they’ll need two goalies to defend their side. In the article you say… “and the admission by an apostle of the faith that for the past 17 years global temperatures have not increased — contrary to the projections of every climate model” and you link to another of your articles http://wattsupwiththat.com/2011/06/11/phil-jones-does-an-about-face-on-statistically-significant-warming/ but that article does not say “the past 17 years global temperatures have not increased”. Instead it says that the data from 1995 which was previously at the 90th percentile is now at the 95th percentile and so is statistically significant. Furthermore in the BBC article you link to it says “HadCRUT shows a warming 1995-2010 of 0.19C – consistent with the other major records” which doesn’t match the statement that you made about no warming. Do you assume that no one clicks on the links and reads them? ……and the old grey New York Times eagerly publishing anything that may tend to confirm their credo. In yet another NYT story (March 7)….. I have to say that the New York Times has an unprecedented history for producing climate fairytales. Here is 150 year’s worth ! Prospects of Another Glacial Period; Geologists Think the World May Be Frozen Up Again. The most drastic potential change considered in the new report (by the National Academy of Sciences) is an abrupt end to the present interglacial period of relative warmth that has governed the planet’s climate for the past 10,000 years. If you plot that out, you will see warming. I really wish the hockey stick was only “wrong but essentially worthless.” In fact the hockey stick is wrong and extreme;y costly. In the eyes of Truth the hockey stick may be wrong and criminal. At least my parents’ alma mater OSU hasn’t yet combined data molestation with child molestation, as at Mann’s PSU. Singer’s former NASA colleague Hanson’s imps in this country tried to hide the decline, & now want to hide the flat line. They lack the honesty of CRU’s Jones. Hanson has gone from scientist to advocate to activist to raving loon (boiling seas!). It is the mainstream scientific community and the weight of research that have generated the theory of AGW, NOT ‘Green forces’ . The hockeystick has never been a central dogma of AGW, the details of paleoclimate may be interesting and instructive, but they have no direct bearing on the theory of AGW. Science does not ‘recycle’ ideas, a obvious bit of strawman polemic, but it does refine, re-examine and validate earlier research by examining the issue with different methodologies. In this case the return of the hockeystick is the result of further research that like all the other research into the climate of the Holocene validates the exceptionality of the recent warming. Forces that are eager to reject the role of fossil fuels in this warming for some reason have become obsessed with attacking the credibility of these paleoclimate reconstructions although they are uncontroversial outside the small fringe who are motivated to reject the AGW theory. Not correct. There has been no statistically significant warming for the past 16 to 23 years.This is not the same thing as “no warming”. Statistical analysis of the datasets tells us that there is a small (very) probabilty that there has been no warming over various periods of time. If the purely arbitrary confidence limit of 95% is used then the probability of no warming, though small, may be large enough to render the result non-significant. It should be noted, though, that this result depends entirely on the hypothesis being tested. In this case the NULL (or default) hypothesis is ‘No Warming’. Change the NULL hypothesis to ‘Warming of 0.2 deg per decade’ and in, most cases, the result will also be non-significant, i.e. we cannot reject they hypothesis that warming has been continuing at 0.2 deg per decade at the 95% confidence level. It was there, some 0,3-0,4 deg C per RSS. There was also +0,7 deg C increase between 1910-1945 in HadCRUT3 global data. A nice storry, yes no warming for 17 years BUT we need at lesst 30 to confirm there is no warming. 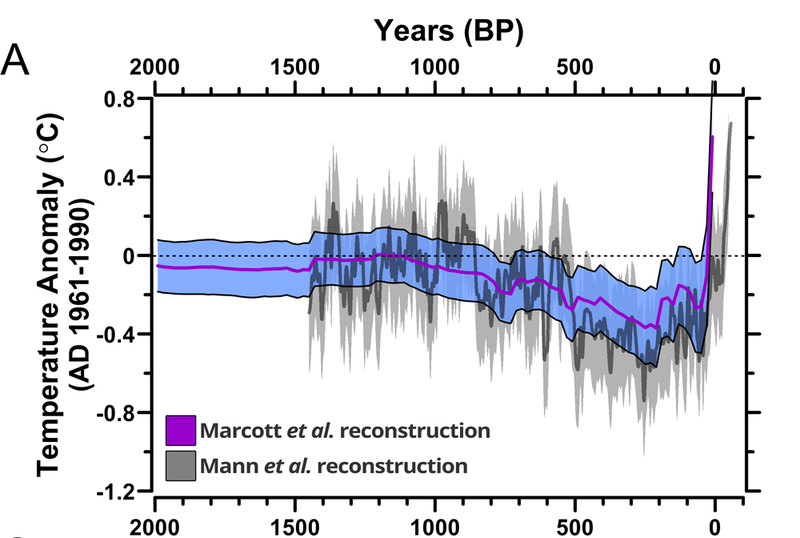 And so the extensive body of evidence which pre-dates Mann’s hockey stick and which demonstrates that the Medievel Warm Period was as warm as it is today — possibly even warmer than it is today — but at pre-industrial atmospheric concentrations of CO2, should be of no real interest when evaluating the validity of the climate prediction models? The evidence which predates Mann 98 is almost entirely from the northern hemisphere and largely N Europe. When evidence from the southern hemisphere was collected the MWP proves to be asynchronous with the N hemisphere and entirely absent in some areas, there is no significant MWP in the New Zealand data. What the MWP does indicate is the climate sensitivity. To the extent that the MWP is global, synchronous and represents a real increase in the energy in the climate system it shows how much warming we may get from the increase in energy from rising CO2. The warmer and more extensive the MWP the more sensitive the climate and the more warming we can expect from the current energy imbalance. “What the MWP does indicate is the climate sensitivity” To what? Historically, it seems that the MWP was positive and the LIA was not so positive. One of the problems, it seems to me, with AGW is that past warming without CO2 is not well explained, so we can’t sort out differences. There is very little evidence of past global warming of any significance without an accompanying change in solar input and/or CO2. The obvious example is the last glacial melt when the date of perihelion and rising CO2 triggered the transition to the present Holocene climate. Your assertions are getting nuttier by the day. The only measured correlation between CO2 and temperature is: ∆T causes ∆CO2 — not vice-versa. Since you presume to understand what caused the Holocene, perhaps you can tell us the date that the Holocene will end. The truth is that no one knows for sure what caused the Holocene, or when it will end. You are just a True Believer in the ability of “carbon” to control the climate. But there is zero measurable evidence supporting that belief. The fact is that rising CO2 follows rising temperatures. Effect cannot precede cause on our planet — maybe on yours. So kindly take your pseudo-science back to your home alarmist blog. They like your kind of anti-science assertions there. The role of CO2 in the GHG effect was elucidated contemporaneously with Darwin’s discovery of evolution. The possibility that industrial production of CO2 would cause warming was hypothesised around the end of the19th century. Even Singer, and certainly Spencer, Christy, Lindzen and even Anthony Watts have published articles validating the GHG effect. As with the actress and the Bishop the argument is not weather CO2 warms the climate, just how much. When the present period gets named the Anthropocene. But if you mean when will the present interglacial period cool down and become another ‘ice age’, possibly never given the warming caused by the massive, unprecedented in millions of years, rise in CO2. If you mean the last melt into the present interstadial then the combination of perihelion date, axial inclination and precession caused enhanced summer melt in the N hemisphere which drove a rise in CO2 which then caused further warming. No one disputes this except a few fringe cranks. And the rising CO2 causes a further rise in temperature, on this planet just because A can cause B, does not prevent from B also causing A. For NOAA, Hadcrut3 and Hadcrut4, we can be more than 95% certain the warming is not significant at 0.2 since 1997. Read back through the posts and check the claim made by the original poster. You have managed to find a couple of datasets that may not include the 0.2 deg/decade trend. We’ll ignore the fact that I, along with most responsible sceptics, consider the UAH satellite data to be the most reliable and that Hadley data was, at one time, considered junk by most WUWT readers. Leaving that aside what you’ve actually shown is that some of the datasets show that warming in the last 16 years (the shorter of the periods mentioned) is unlikely to be as much as 0.2 deg per decade. Let’s just summarise your findings, i.e. Some of the IPCC recognised datasets show that warming over the past 16 years is unlikely to be as high as 0.2 degrees per decade. Not exactly affirmation that global warming has stopped is it? In fact the above statement (in italics) is just as, if not more, valid than the ‘global warming has stopped’ statement. So until we get Version 6, perhaps we should rely more on RSS. And for the last 16 years and two months, since January 1997, the slope is = -0.000464995 per year. As well, Hadcrut3 and Hadsst2 are almost at the 16 year mark with a slope of 0. It could be reached with the February data, but we will have to wait and see. Those AGW fanatics have got up to some ghastly tricks recently. Severe floods in UK over the past year, plus recent ones in France, Macedonia, Madagascar, The Philippines, Australia, Peru and Bolivia. Not to mention all sorts of extreme climatic events in USA, and the odd drought elsewhere. While they can pull off tricks like this, skeptics are going to have a hard time getting our views heard. Never mind, keep on trying. Good point Eric …. of course, none of these things have ever happened before, it is really quite horrifying! …. tis amazing what havoc a 0.4 C increase in average global temperature over 100 years can suddenly and inexplicably decide to wreak in one particular 12 month period. Such proof is obvious and devastating. No doubt the climate is a savage and unpredictable beast, especially in the hands of a gullible mainstream media and a bunch of noble cause clowns. There are no empirical, testable measurements to support that conjecture. 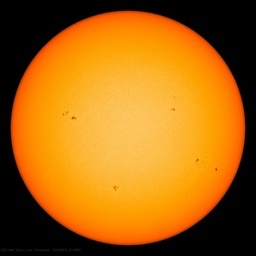 If you disagree, produce those verifiable measurements proving AGW now, izen. Otherwise, your conjecture is just an evidence-free opinion.